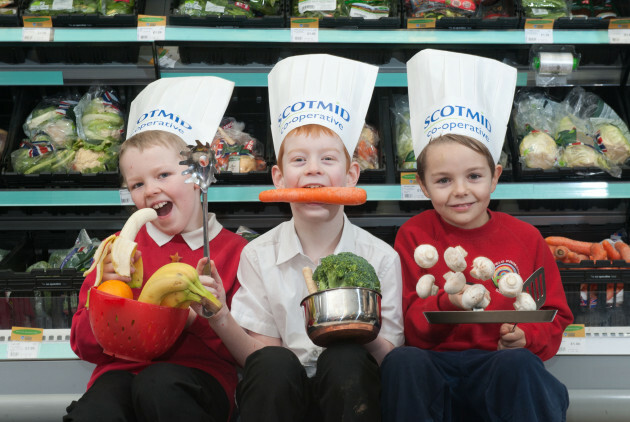 Lawfield Primary School children help launch the Eat Well Campaign. "This is a fantastic project that truly belongs to the Mayfield and Easthouses community." A new community healthy eating project that features recipes from Mayfield and Easthouses residents was officially launched today (17 January 2014) by Scotmid Co-operative and Midlothian Council at Scotmid’s Mayfield store. The ‘Mmmm Mayfield and Easthouses Eat Well Campaign’, which is funded by Scotmid Co-operative, is designed to encourage local people to cook healthier meals at home more frequently. 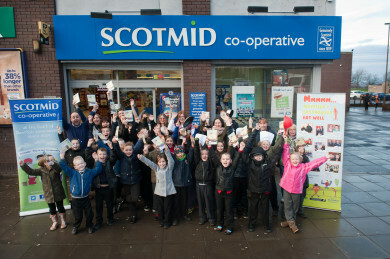 Children from Mayfield Primary and Lawfield Primary help launch the campaign. As part of the project, free recipe cards with recipes contributed by people in the local community will be available at Scotmid’s Mayfield store, with a new recipe card launching every two weeks. A new community newsletter will also be launched. The campaign is part of the Food for Thought initiative for Mayfield and Easthouses by NHS Lothian Health Promotion Service and a Community Planning Partnership piece of work. The initiative aims to improve community access to affordable healthy foods, increase cookery knowledge and skills and promote enjoying healthy foods. The recipe cards feature a number of simple, quick and healthy recipes, including a Chicken and Bean Stew from Mayfield Community Police, Chicken Curry from Y2K Youth Group, and chicken fajitas from Mayfield Primary. Local school children from Lawfield Primary also helped to design the artwork for the recipe cards. Scotmid has launched similar projects in Portobello, Moredun and Gracemount in Edinburgh and supports a number of health promotion initiatives in local communities across Scotland.